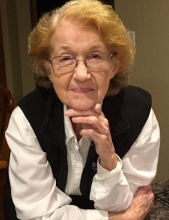 Dorothy Jewel Dunbar, age 86 of Fredonia, KY passed away on Friday, April 5, 2019 at her home. She was a retired quality inspector for Shawnee Plastics and a member of Paducah Seventh-day Adventist Church. Survivors include her husband, Floyd Thomas Dunbar; one daughter, Donna Dunbar of Eddyville; one son, Paul Dunbar & wife, Dianne of Pittsboro, IN, retired and moving to Gilbertsville, KY; one brother-in-law, David Dunbar of Fredonia; one granddaughter, Elizabeth Rose; two great grandsons, Cooper and Casey Dunbar; one granddaughter-in-law, Lindsay Dunbar. She was preceded in death by her parents, Henry and Julia Elizabeth Stephens Arnold; one son, Gary Dunbar; one grandson, Sean Dunbar. 2:00 PM, with Pastor Mike Burks officiating with burial to follow in Cedar Hill Cemetery. Memorial contributions may be made to Pennyroyal Hospice, 220 Burley Avenue, Hopkinsville, KY 42240. To send flowers or a remembrance gift to the family of Dorothy Jewel Dunbar, please visit our Tribute Store. "Email Address" would like to share the life celebration of Dorothy Jewel Dunbar. Click on the "link" to go to share a favorite memory or leave a condolence message for the family.